1. Preheat oven to 350 degrees. Butter a 2-quart casserole dish. 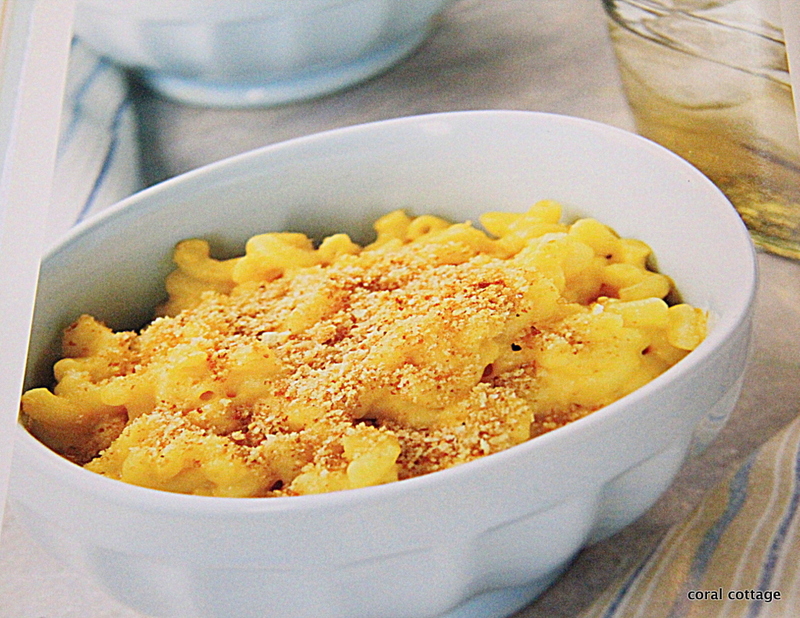 Bring 4 quarts water to a boil in a large pan and add the 2 teaspoons of salt and macaroni. Cook pasta for 10 minutes, or until just tender. Do not overcook. 2. Make the sauce by melting the butter in a 1-quart saucepan. Using a wire whisk, stir in the flour and 1 teaspoon of salt, stirring and cooking over medium heat until it bubbles and the flour turns pale brown, about 3 minutes. 3. Remove the pan from the heat and slowly whisk in 1 cup of the milk. Return the pan to the heat and add the remaining cup of milk. Continue to cook and stir until the sauce thickens. Add the cheese and stir until it melts. 4. Add the drained macaroni and cheese sauce and mix thoroughly. In a small bowl, stir bread crumbs together with the melted butter. 5. Transfer the macaroni mixture to the prepared pan. Top with butter crumbs and bake for 15 minutes or until the dish bubbles around the edges. Per serving: 660 calories, 24 g protein, 72 g carbohydrates, 31 g total fat, 18 g saturated fat, 90 mg cholesterol, 1,020 mg sodium, 3 g fiber. Calories from fat: 280.